After some lovely weather, the temperature took a dive and there was even snow reported in some areas during the week! The forecast wasn’t great for today either although when I picked Janders up it was dry albeit a tad windy. We got to Bridgwater and as we parked up, the pegs in front of the car park (37-39) look fairly sheltered and I said to Janders I’d love to have 38 today. After paying our pools, Pete said it would be a rover today and he was paying the top two carp and silver weights. The draw was announced and Janders pulled out choice number three, Bill had number two which was also the golden peg and then I grabbed a peg and when I looked, I’d only gone and got first choice so I got my wish and went for peg 38. 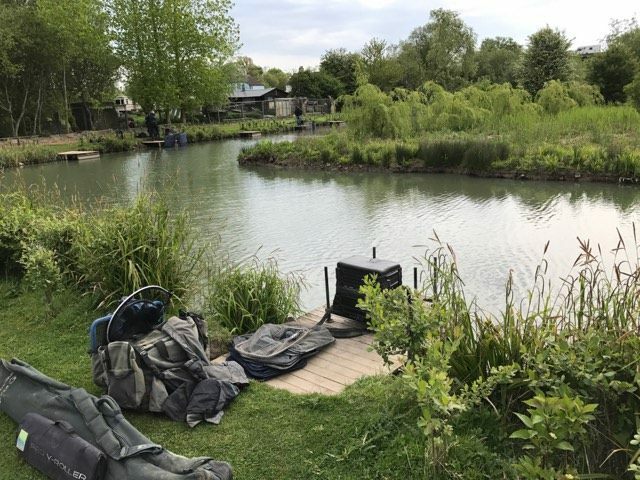 Janders decided on peg 4 with Bill on 2, John Barker was on 33, Jacko chose 31, Steve Kedge went for 10 and Jeff was the only angler on the bottom bank on number 17. My peg looked nice and I set up a 10 x 11 MW F1 Slim for fishing two lines at 8.5 metres and another at top two plus one and also a 0.3 gram NG Mini Gimp for fishing on the inside to my right. Bait was just some micros I’d soaked yesterday and 4mm expanders for the hook. On the whistle I fed all four lines with some micros before starting on the inside line, I had a few knocks before the float sailed away and I hooked a lump which turned out to be a 5-6lb carp, next chuck I lost a carp and when the next bite resulted in another carp, it was time to try another line. I had to wait a while for my first bite at 8.5 metres but it was carp number three and after half an hour, I hadn’t had a skimmer yet! I finally got off the mark with a couple of small skimbobs but as the first hour came to a close, it had been a less than inspiring sixty minutes. From what I could see, nobody looked to be bagging, Bill had landed a couple of carp and I’d seen Janders catch a few small fish but that was about it. The second hour was more of the same with just a few 2-3oz skimmers and a couple more carp to show for my efforts as I swapped between the two longer lines. Going into the third hour it had started raining, the wind had picked up and I hadn’t put much in my silvers net at all! Then a bite on the right hand line saw a good skimmer come leaping out of the water and I safely netted my first decent fish. A couple more smaller skimbobs followed along with the inevitable carp and Pete asked how I was doing, I said I was struggling and he said John on 33 was only admitting to 2lb or so although Jacko had landed a few skimmers but nobody was really bagging on silvers. Then I hooked a fish which didn’t feel like a carp (but then half the time the carp don’t feel like carp when you first hook them!) and a lovely crucian popped up, things got even better when I had another next chuck and although I only had around 3lb of silvers as the half way point approached, at least I was starting to get the odd better fish. The weather was now pretty miserable and I was regretting not putting my wellies on as my feet were soaked. Janders went to use the loo and stopped to ask how I was doing, I told him and he said he had a tench and a few small skimmers so he was struggling too. I tried the inside line again and had two more carp but then disaster struck when two of my pole sections got stuck together which made trying to fish the shorter lines very awkward! I could see John Barker was starting to catch skimmers quite well and Janders netted two decent ones in quick succession whereas all I could catch was carp and the odd little skimmer. With around two hours to go, the weather eased up a bit, the pole dried off and I was finally able to get the two joints apart. The wind had also dropped and I could see carp blowing on all four of my lines – great! I had another nice crucian and a decent skimmer from the short line plus a couple more carp and then hooked a fish which I would have sworn was a crucian or tench until a little 10oz carp came up! Going into the last hour, the rain returned and after yet another carp I tried the longer lines again and had two 3-4oz skimbobs come off shipping back. Bill was now bagging on carp and even had a couple of good skimmers and a big perch! With fifteen minutes to go I was back on the short line and I had my fourth crucian followed by a little skimmer and then another good leaper to finish with a flourish. As Pete signalled the all out, Janders was playing a carp and he gave it some stick only for it to turn into a decent tench! I ended up with 24 silvers (4 crucians, 3 good skimmers and the rest small skimbobs) for about 6-7lb and at least 15 carp. Jacko walked up and said he thought he had 9lb of silvers and that John Barker had more than him so I thought that was that. John was first to weigh and had a nice bag of skimmers weighing 13lb 2oz and had caught well after a slow first couple of hours. Jacko had 7lb 14oz of silvers and 61lb 13oz of carp, next up was silvers specialist Jeff Sparkes who had 7lb 12oz and I thought I wouldn’t be far off that weight. 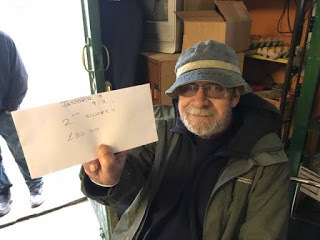 Steve Kedge then plonked 138lb of carp on the scales to go into the lead and as we walked up to weigh Janders in, he was admitting to 8lb but weighed 9lb 2oz and I knew I didn’t have that. Bill also broke triple figures with 109lb 5oz and I was last to weigh, my carp went 49lb 10oz and then my silvers fell just short as I weighed 8lb 7oz and Janders won the pound thanks to his last gasp tench. Back at the results and after a very welcome cup of coffee, Pete announced the winners and Janders looked very happy with his envelope for second in the silvers, well done mate. We’re back again next week and its a rover on all ponds except Longs although I’m not sure I’d like first choice again as the last couple of times I’ve had it, I haven’t done very well. Hopefully the weather will be a bit better too!